WEST LAFAYETTE, Ind. — A group of Purdue University engineering students is working with Habitat for Humanity International to develop disaster-resistant homes for Haiti. In the wake of the Jan. 12 earthquake in Haiti, the team now will investigate ways to create housing that is both wind- and earthquake-resistant. In addition to being disaster resistant, the housing must be affordable and efficiently designed to be built on a mass scale under time, material and worker-skill constraints. The students are in Engineering Projects in Community Service (EPICS), a service-learning program at Purdue in which teams of students work with local partners for community improvement. About five years ago, the Purdue EPICS team began working with Habitat for Humanity International to develop housing that could withstand natural disasters. For the last two years, a group of five to seven students has been working specifically on developing affordable housing for Haiti that could withstand hurricane-force winds. The project team completed designs of several modular homes last semester as part of the “Haiti Blocks” project. That project assessed the situation in Haiti (pre-earthquake) and the scale of the expense of cement building blocks for the population. The team then thoroughly researched the building sites in Haiti with regards to availability and economic feasibility of raw materials, environmental conditions, and socio-economic conditions to determine their limitations and constraints. Using this information, they designed several different formulations of blocks that are simple and use a process which requires the least maintenance possible. 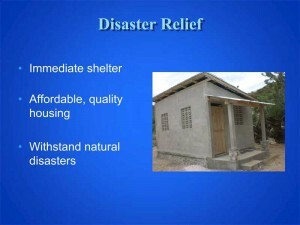 The Haiti Blocks project has now been incorporated into the Disaster Relief project and the team is currently searching for a professional partner to assist in the in-depth structural design of the homes. The team hopes to have final design work completed in a year.